Eddie Huang was finally happy. Sort of. He'd written a bestselling book and was the star of a TV show that took him to far-flung places around the globe. His New York City restaurant was humming, his OKCupid hand was strong, and he'd even hung fresh Ralph Lauren curtains to create the illusion of a bedroom in the tiny apartment he shared with his younger brother Evan, who ran their restaurant business. Then he fell in love—and everything fell apart. The business was creating tension within the family; his life as a media star took him away from his first passion—food; and the woman he loved—an All-American white girl—made him wonder: How Chinese am I? The only way to find out, he decided, was to reverse his parents' migration and head back to the motherland. On a quest to heal his family, reconnect with his culture, and figure out whether he should marry his American girl, Eddie flew to China with his two brothers and a mission: to set up shop to see if his food stood up to Chinese palates—and to immerse himself in the culture to see if his life made sense in China. Naturally, nothing went according to plan. Double Cup Love takes readers from Williamsburg dive bars to the skies over Mongolia, from Michelin-starred restaurants in Shanghai to street-side soup peddlers in Chengdu. The book rockets off as a sharply observed, globe-trotting comic adventure that turns into an existential suspense story with high stakes. Eddie takes readers to the crossroads where he has to choose between his past and his future, between who he once was and who he might become. 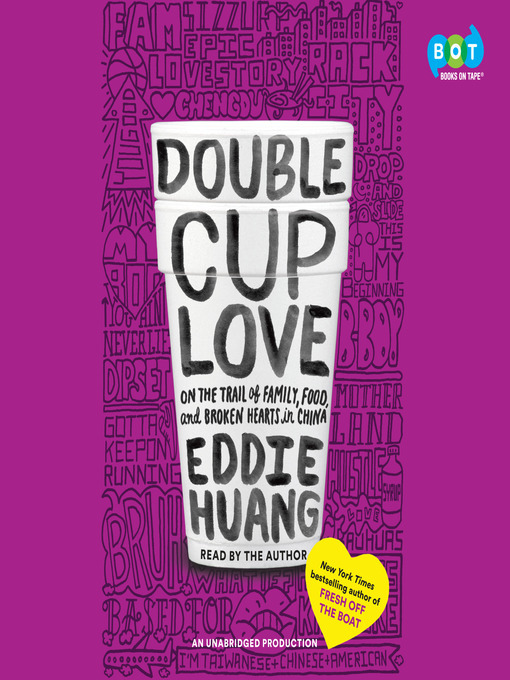 Double Cup Love is about how we search for love and meaning—in family and culture, in romance and marriage—but also how that search, with all its aching and overpowering complexity, can deliver us to our truest selves.